Inter-class variation is often small (many cars look alike) and may be dwarfed by illumination or pose changes. There may be many classes but few or just one positive ``training'' examples per class. Where step 1 learns category specific characteristics, while step 2 creates an object specific classifier. Andras Ferencz, Erik Learned-Miller, Jitendra Malik. Learning to Locate Informative Features for Visual Identification. Vidit Jain, Andras Ferencz, Erik Learned-Miller. Discriminative Training of Hyper-feature Models for Object Identification. Andras Ferencz, Erik Learned-Miller, Jitendra Malik. Building a Classification Cascade for Visual Identification from One Example. Andras Ferencz, Erik Learned-Miller, Jitendra Malik. Learning Hyper-Features for Visual Identification. 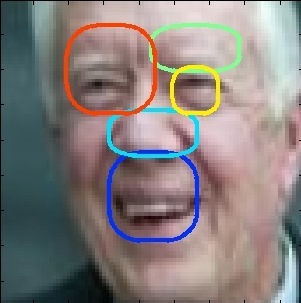 Car and face classification examples (with the matched patches marked). Our car data set and an implementation of our system is available for download here. 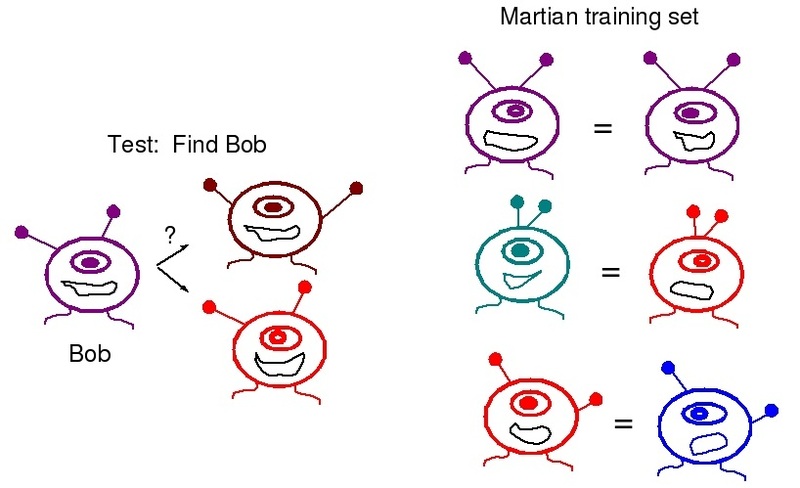 If we knew nothing about Martians, finding Bob after having seen only a single image of him before, would be impossible. However, with a training set of other Martians, even if Bob is not in this set, the problem becomes tractable.